Most audio drama podcasters will express sincere gratitude when they find out you’ve been listening to their show. Then they’ll sometimes wince a little when they find out how you’ve been listening to it. Low-budget, low-quality earbuds are a common way of consuming any type of audio from your smartphone or device. This makes sense because most people don’t consider themselves audio purists or “snobs”. Very few consumers ever listen to audio in optimal conditions either. Naturally, listening is mainly taking place on public transport, on busy streets, or in places where there’s lots of external noise competing for your ear’s attention. People are used to all this though. To your average consumer of audio, what they’re listening to sounds just fine in their trusty £5 buds. In a sense, they’re right. Low-end gear won’t make a well made production sound bad as such, it’s just that you’ll lose a huge chunk of the experience. Imagine watching a film in the cinema with your sunglasses on. You’d still be able to follow the plot, see exactly what’s happening and enjoy the story. But you’d definitely be placing limitations on the experience. And because audio isn’t a visual medium (at least, not literally) these limitations can be much less obvious if we don’t already know what we’re missing. There are two things the audio drama producer will use to tell you a story. These are necessary not only for you to understand the story, but to help you enjoy it too. Audio – it sounds very obvious, but there’s absolutely no visuals in use. Only dialogue, sound effects and music. Your imagination – as the audio plays, your brain interprets it and builds living, moving pictures in your mind. Of course, we know from the ancient art of campfire stories, through to the popularity of audiobooks today, that sound effects and music aren’t a necessary part of you forming visuals in your mind. There’s no single right way to tell a story. But one of the huge strengths of audio drama is how much sensory information it’s giving your brain to work with. As an audio drama producer, there are a few laborious tasks involved in the mixing process. But, once all the dialogue is cleaned up and laid out, the fun starts when you begin to build the world around these conversations and interactions. A producer can spend hours micromanaging every nuance of half a minute of audio. That in itself is a big clue that there might be a lot more in your favourite audio drama than your cheap earbuds are letting you hear. Of course, you’re still free to make your own decisions about how you consume audio drama. But if a producer is spending all that time making something for you, it’s only natural that you might start to get curious about how much better their show might sound if you – to go back to our earlier analogy – took the sunglasses off. So, if you’re already won over to the idea of upgrading your headphones though, where do you start? Over-ear headphones are generally going to provide a better listening experience as they’re isolating your ears from the external noise around you. They also contain more room for manufacturers to work with when they develop and build new models. With that said, they’re also far less portable than their earbud counterparts. A pair of earbuds are easily kept in one of your pockets, ready to use whenever the opportunity arises. 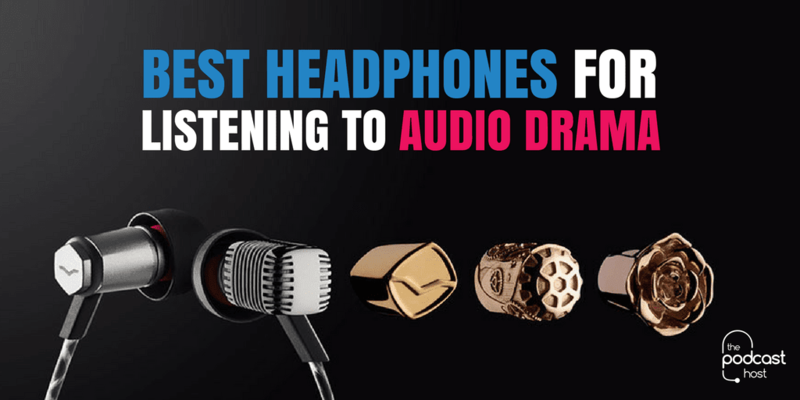 Manufacturers know that earbuds are easily the most common way of consuming audio on-the-go. That’s why there are a lot of high-end models out there nowadays that claim to still offer a first class listening experience. If you prefer earbuds for their convenience and portability, then there’s an almost infinite world of choice out there. Here’s 3 that you might want to consider though. Still unable to part with more than a tenner for your earbuds? If that’s the case then the Panasonic Ergo Fit are the best in their price range. The V-Moda Forza range is aimed at audiophiles, has models specifically built for Android and Apple devices and even has sport-fit models to keep them in your ears when out running or excercising at the gym. If you’re more concerned with keeping external noise out of your audio then a noise cancelling set might be for you. The Bose QuietComfort 20 have little mics built in to them designed to pick up the sounds around you and neutralise them. If you’re not put off by having to carry them around with you, and want to opt for the over-ear option, then one of these three might be worth considering. AKG make some of the finest microphones on the market, so they know good audio quality. Their AKG K92 provide a premium listening experience at a very reasonable price. Part of Grado’s Prestige series, the retro-looking Grado SR325e headphones are a great option if you do have the luxury of listening in more preferable conditions, as well as a little more cash to spare. Like their earbud alternatives, the Bose QuietComfort 25 noise cancelling headphones pick up and neutralise the sound around you. They also fold up into a small carry case too, so they’re more portable than many other models of over-ear phones. Have you any experience with the models listed above? Or do you recommend any other sets for an optimal listening experience? Let me know in the comments section below. And if you’re looking for some quality audio drama to test out the quality of your headphones, check out our best fiction podcasts roundup.